Posted in Headline | Comments Off on Grus Americana newsletters available on line. The Fall 2016 Newsletter has been posted. The Spring 2017 Newsletter is now available to members. If you are not a member, please join the Whooping Crane Conservation Association to get your copy. The most recent newsletter contains articles on: a record setting year in Wood Buffalo National Park; updates on the Aransas/Wood Buffalo Population, the Eastern Migratory Population, the Louisiana Nonmigratory Population and the remnant Florida Nonmigratory Population; the closure of the USGS Patuxent Wildlife Research Center captive breeding program; crab trap cleanup at Aransas; and how members can participate in the purchase of whooping crane habitat. We also introduce a new book on environmental activism, give an update on new charges against a whooping crane poacher and acknowledge the passing of Glen Smart. Posted in Headline | Comments Off on New Grus Americana newsletter available on line. A record number of whooping crane nests have been found in Wood Buffalo National Park during the 2017 nesting survey carried out by Parks Canada and Environment and Climate Change Canada. This year’s survey found 98 nests, an increase of 16 over the previous record of 82 set in 2014. Mike Keiser of Parks Canada told us that habitat conditions were excellent with most wetland basins being full. Surveys were conducted May 18-21, 2017 and were done by Parks Canada, Environment and Climate Change Canada and the Government of the Northwest Territories. 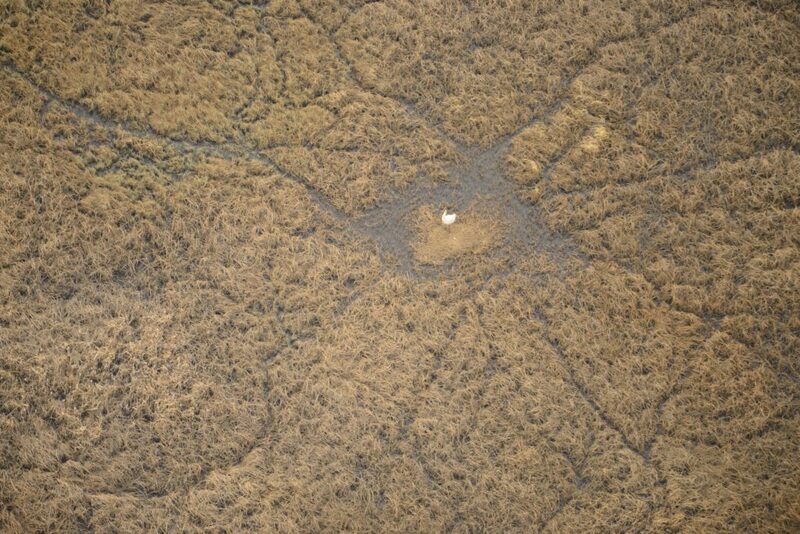 This was the 51st year of annual surveys of the whooping crane population. Mark Bidwell of Environment and Climate Change Canada said that the large jump in nests from previous years is a result of 2 things; the arrival at breeding age of the large number of young that were produced during the period 2010-2013 and the excellent habitat conditions that provided an abundance of suitable nesting sites for the cranes. The next set of surveys will be conducted in August to determine the number of young fledged. Photo courtesy of John McKinnon Parks Canada. The latest issue of Whooping Crane Conservation Association newsletter, has been mailed to members, to obtain a copy please go to our Membership link to join the WCCA and help support whooping crane conservation, a bargain at only $20. 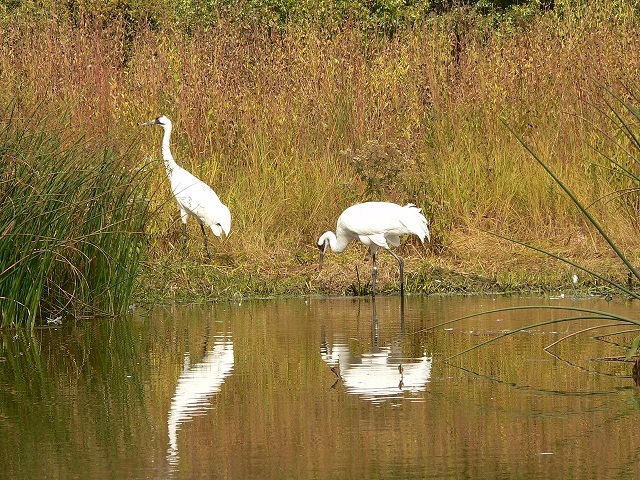 The newsletter contains items such as: how the WCCA was able to participate in a project to secure wintering habitat for whooping cranes on the Texas coast and how you may be able to help support additional purchases of this fast dwindling resource in the future. We also have important updates on all the wild populations of whooping cranes including the natural Aransas Wood Buffalo Population and the three introduced populations (Eastern Migratory and the Florida and Louisiana Resident populations). 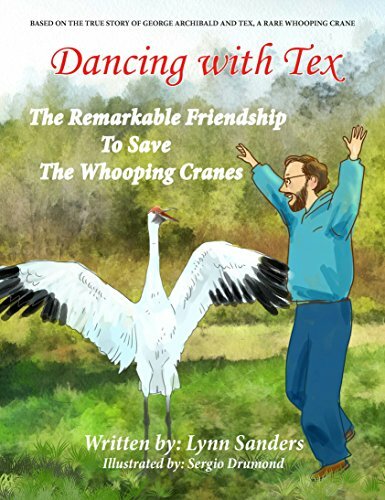 An exciting new children’s book about the bond between a human and a crane is introduced. There is also an update in the sentencing of an individual who shot two whooping cranes in Eastern Texas and how the WCCA helped solve the case by providing a reward to the informants. Older issues of Grus Americana can be viewed free at our Newsletters link. Posted in Headline | Comments Off on Happy New Year! Matthew Butler and Wade Harrell of the US Fish and Wildife Service have just released the results of this past winters whooping crane surveys. A total of 329 birds were observed on the Aransas National Wildife Refuge and surrounding area, another 9 birds were outside of the primary survey area bringing the population to about 338 birds. Read the full report on the US Fish and Wildlife Services website.